Ring in the New Year with Theodore Bikel! Around town with photos of D.C. Chanukah parties! Merry Christmas to those who celebrate, and Happy Chanukah to my fellow Jews! Hope everyone had a wonderful day. I’ve attended three Chanukah parties so far and though we’re only half way through, I believe I’ve reached the end of my run. 😦 I hope that the rest of you enjoy the remaining festivities, some of which you can find detailed here. In the meantime, I’ve taken a bunch of photos that I would like to share! Please enjoy this collection from Young Professional Kesher’s No Limit Texas Dreidel Chanukah Party, the lighting of The National Menorah on the White House lawn and Hanukkah Happy Hour on the Hill. Note: WordPress is a meanie and won’t let me embed, so view the slideshow by clicking here. Here’s to hoping for a great Chanukah part two! The winter season is upon us- the weather turns cold and icy and people begin to count the days until they get a little time off from work or school. Why not warm yourself by the kindling Chanukah lights? Local Jewish groups are getting ready to roll out the red carpet for this well-known religious holiday, which will take place this year from sundown Dec. 21 to sundown Dec. 28. 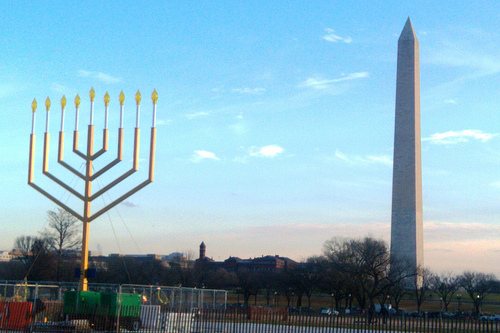 Holiday walking tour of D.C., followed by a lighting ceremony at the National Menorah. Ends with a tour of the White House lawns and 50 Christmas trees decorated in honor of the US. Author Meredith Jacobs of “The Modern Jewish Mom’s Guide to Shabbat” speaks at Sixth & I Historic Synagogue of ways to enjoy Chanukah and find meaning in its festivities as a family. …is it time for matzah and the four questions of Passover? No, but join in this Jewish Study Center event to get all your questions answered with writer/producer Dave Smolar. I’ve made plans to be at the YPK party, Hanukkah Happy Hour, the National Menorah Lighting, and Club Ei8ght. I hope to see you all there! Happy holidays to everyone celebrating. I hope that they are filled with light. 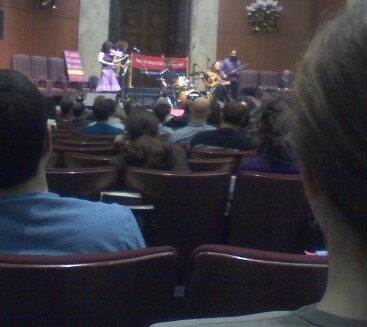 I first heard of Pharaoh’s Daughter in 2003 when they performed at a summer Jewish retreat that I attended. Sitting in the audience now, everything felt different than that evening—from the weather to the location to where I was in life. But it didn’t take much to transport me back to the wild hills of California where, like here, Basya Schechter led her group through Hassidic chants, Ladino ballads, and energetic drum sessions. I have to give particular kudos to Meg Okura, who was rockin her violin. Honestly; most of the time, I feared she might break it with the amount of vigor she possessed, but the passionate, energetic sound was out of this world. Following the concert, which lasted around an hour and 15 minutes, young professionals were invited upstairs for the regular schmoozing and socializing. Hopefully, much fun was had by all. Pharaoh’s Daughter is based in New York, but they are known the world over. I highly suggest that you look them up if they are in your area! Check out their MySpace page for more.